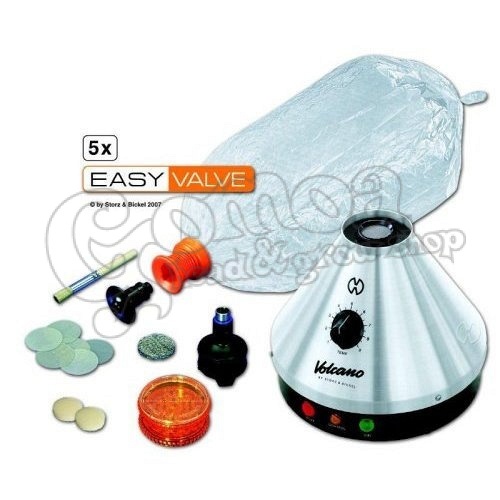 Product code: HED0270 Videó: Unboxing Volcano Classic Vaporizer with Solid Valve Kit in 1080p HD! Not many people know that the Volcano Vaporizer is hand made in germany. From automobiles to lenses, German craftsmanship are known throughout the world as among the best. So if you’re going to inhale something into your lungs, you might as well have German engineering behind you. That’s what you get with the Volcano Vaporizer. “Volcano” is the right name, this thing packs a punch for sure. The delivery method for this vaporizer is via a balloon bag attachment. You are able to easily adjust the size of the balloon so that you don’t bite off more than you can chew. The Volcano comes with a full roll of the bags so you can replace or make new ones of different sizes as desired. The Volcano is a product of Storz & Bickel and is without a doubt the crown jewel of all vaporizers, mighty pricey but well worth it. When you use the Volcano, whatever you inhale will reach you along the healthiest and safest possible path.